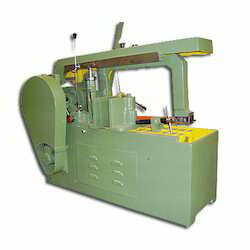 We are highly instrumental in the process of manufacturing and supplying of a wide range of Hacksaw Machine. These are manufactured using supreme quality raw material to ensure we meet international standard of quality. Offered by us these hydraulic hacksaw machine are sturdy built and dimensionally precise configuration and popular amidst our clients for their high performance. These hacksaw machine are easy to install and operate. They are offered in various specifications. We are a well-known organization that is engaged in manufacturing and exporting a vast range of Hacksaw Cutting Machine These Hacksaw machine has been specifically designed in tandem with the industrial standards and has been availed to the customers at market leading price range. These machine features qualitative motor pulley, mechanic coolant pump, electrical internal wiring, control switch, V-belt and various other advanced specifications to make sure they deliver high performance.